Cost: Set lunches are £26.50 or £29.50 for 3-4 courses, with a tasting menu for £75. From the a la carte menu, antecuchos, ceviches, tiraditos and small dishes cost from £4.50 to £16.50. Main courses are priced from £12 to £72 (for a rib of beef for 2). About: Coya Restaurant and Bar sits on Piccadilly, facing Green Park in a prime but until recently rather quiet area of Mayfair. The modern Peruvian restaurant is in three sections in the basement of a fine Georgian building, with the members-only Coya Club on the ground floor. The restaurant is sleek and features a stunning Ceviche Bar, an Open Charcoal Grill area and the Central Kitchen. Opened in January 2013 by entrepreneur Arjun Waney, who also owns Zuma and Roka, Coya is the first in the group to offer Peruvian-inspired cooking. Head chef Sanjay Dwivedi spent sometime in Peru, travelling and learning the ropes at Lima's famous Astrid y Gaston Restaurant, and has managed to put together an impressive menu. Besides being the head chef for the Rolling Stones, his track record of cooking at Michelin-starred Zaika, The Ivy and Le Caprice is admirable. Whether Sanjay Dwivedi’s cooking at Coya is as authentic as one would find in Peru is open for interpretation – a lot can be argued about this man’s cooking but anyone who has eaten his food would most certainly agree – his dishes are well thought-out and bursting with flavour! Peru, like Brazil, has had many influences from other cultures including Japan and China, and its cuisine reflects this. I was pleased to see a great number of Peruvian-Nikkei and Chifa dishes on Coya’s menu and having the Zuma and Roka connection may have facilitated this. Designed by David d'Almada, Coya’s attractive dining room blends antique Peruvian furniture with contemporary decor and colonial furniture, and discrete low-level lighting. What We Ate: We opted for the tasting menu for £75 per person. This started with a beautifully presented platter of 3 ceviches, 1 tiradito and a beetroot salad over crushed ice. The classic Peruvian ceviche was “Lubnia Classico” made from sea bass with red onions, sweet potato, white corn and a well flavoured leche de tigre (literally translates as “Tiger’s Milk”, this is the marinade juices of lime and raw fish). We also had ceviche “Dorada Criollo” with sea bream, cream of aji amarillo (Peruvian yellow chillies), crispy corn and coriander. These were as good as anything we had on our recent trip to Peru, and fine examples of their kind. Alongside, we had a Chifa take on the Peruvian’s national dish “Ceviche de Atun Chifa” made with prime yellow-fin tuna, soy sauce, sesame-seeds and shrimp cracker. Chifa is the Peruvian word for Chinese-Peruvian cuisine/restaurants and this ceviche encapsulated the blending of these two cuisines. We really enjoyed tiraditos in Peru – tiraditos are the Japanese-influenced adaptation of ceviche using raw fish sliced sashimi-style, rather than in the traditional cubes, and with little or no raw red onion. Coya’s Peruvian-Nikkei “Tiradito de Cobia” used cobia fish (from the seabass family), with dashi, truffle oil and chives. Deliciously creamy, it had wonderful umami elements from shiitake mushrooms, yuzu-ponzu sauce, dashi, soy-milk and truffle. I really loved this dish. Accompanying the ceviches and tiradito, we had “Remolacha” - a deliciously refreshing salad of golden beets, aji amarillo (yellow chilli), goat's cheese, hazelnuts and pomegranate seeds. Following on, we were served 3 dishes from Coya’s open charcoal grill including “Anticucho de Pollo” (barbecued chicken skewers) seasoned with aji amarillo and garlic, these were very well-cooked and succulent. The “Anticucho de Setas” (barbecued forest mushrooms) had a lovely smokiness from the aji panca and cumin used in the marinating sauce – these were meaty and very moreish. The 3rd charcoal grilled dish was “Pulpo al Olivo” (Josper grilled octopus) served with pureed Peruvian olives, potatoes, and grilled charred cherry tomatoes – it is always a joy to eat well cooked octopus (something I hardly make at home) and Coya’s was no exception – it was meltingly tender and beautifully seasoned. Accompanying our grilled selection, we had “Ensalada de Maiz” (corn salad) – this contained soft white corn, crispy corn (chanca), and sweet corn, red chillies and finely chopped onions as well as plenty of contrasting textures and flavours. My favourite dish of the meal, the “Arroz Nikkei” of lobster, lime and chilli was to die for. Made with short grain rice (the preferred rice in Japanese cooking), this was wonderfully creamy, with generous chunks of lobster meat and intensely flavoured bisque containing dashi, mirin and soy sauce, lifted up by a refreshing zingness from the chilli and lime. Truly sensational. The “Lubina Chilena” or Chilean seabass had been marintated for 72 hours with white miso, sake, pisco and aji amarillo – this was sweet, delicate and delicious although the aji was not very pronounced in the flavour profile. We also shared a “Solomillo de Res” (Beef) – this was a lightly spiced beef fillet seasoned with aji rocoto and heady star anise served with crispy deep-fried garlic. It was beautifully tender, richly flavoured and cooked medium rare just as ordered. Accompanying our mains, we had a generous portion of sprouting purple broccoli, griddled in chilli and garlic butter and a sprinkle of sesame seeds which was spot on. For pre-dessert (love the idea of pre-desserts! ), we had “Chicha Morada”, the ubiquitous purple corn of Peru used to make one of their national soft drinks. I tried this whilst in Peru but felt it was rather sweet and lacking in acidity. Coya’s chicha morada dessert was a delightful combination of flavours and textures of granita, jelly and ice cream made from this corn - it was refreshing (rather than cloyingly sweet) having been flavoured with rhubarb, orange shortbread and various spices including star anise, clove, and cinnamon. The dessert was a sharing platter containing, not one but 3 different puddings – “Parfait de Arabica” was a coffee parfait, coated in Kiwicha (similar to quinoa), over caramelised bananas, chocolate and Zacapa 23 year old rum. We also enjoyed “Caramelo con Chocolate” and “Frambuesa Sorbete” – these were salted caramel ganache with peanut brittle and raspberry sorbet with jelly & fruit, and a deliciously alcoholic pisco raspberry sauce. I really could not think of a better ending to this meal! What We Drank: Cocktails range from £11.95 (for a Pisco Sour) to £14.50. The house white is an Argentine Torrontes for £28 per bottle, with red wines also starting at £28 for a Chilean Carmenere. All the wines on the menu are either Old World or from South America. We kicked off with a well-made Pisco Sour (£11.95) which went down well with the guacamole and tortillas we were served on arrival. 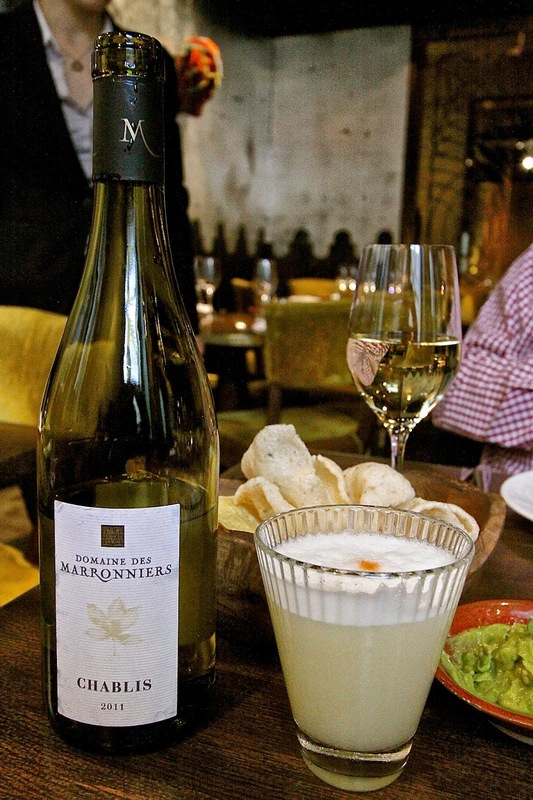 To accompany the ceviches and lobster rice, we enjoyed a couple of glasses of an excellent Chablis (chardonnay) by Domaine des Marronniers 2011 (£65/bottle). 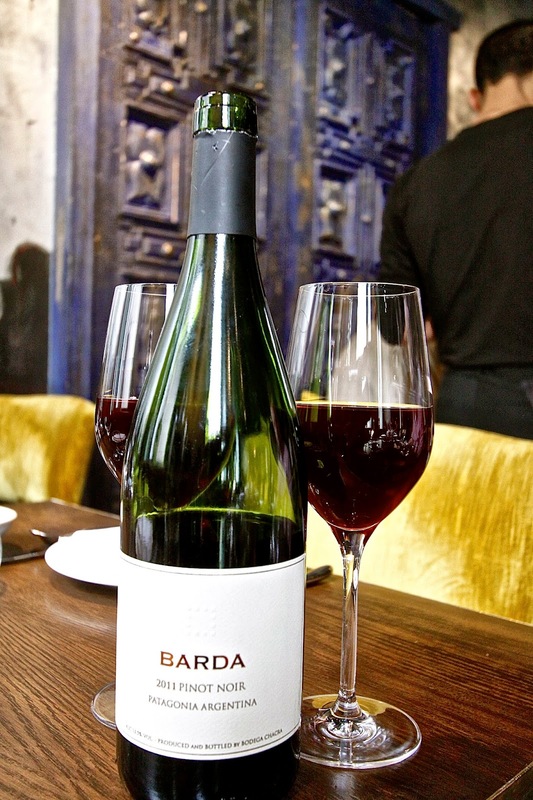 With our mains, we had a glass of 2011 Argentinian Barda Pinot Noir from Bodega Chacra (£55/bottle). This was soft, with red berry fruit, gentle tannins, and somewhat sweet on the finish. Likes: the Nikkei tiradito was exceptional as was the Nikkei lobster rice and the desserts. The ceviches were fresh and bursting with flavour. Excellent value tasting menu. Verdict: Few restaurants have excited me as much as Coya lately – Sanjay Dwivedi’s cooking and his understanding of Peruvian flavours have truly impressed me. The tasting menu at £75 is great value and I cannot wait to return. Very highly recommended.